The royal baby and future King George VII was welcomed into another anachronistic pillar of the British establishment, the Church of England, in a simple christening ceremony at a parish church in Dalston. No, sorry, it was conducted with due pomp and circumstance by the Archbishop of Canterbury in the Chapel Royal at St James’s Palace. After a packed 2012 with a jubilee and a royal wedding, fawning royal fans are keeping busy with the bunting and flags. The latest event also allowed them the delicious frisson of seeing Prince Harry and Pippa Middleton together again. The parents’ siblings delivered the readings, which were happily taken from St Luke and St John. As Harry and Pippa have about three brain cells between them, asking them to come up with something original might have been embarrassing. Royal groupies were disappointed that the ceremony was a private occasion, with no crowd-pleasing waving of babies at gawping onlookers. 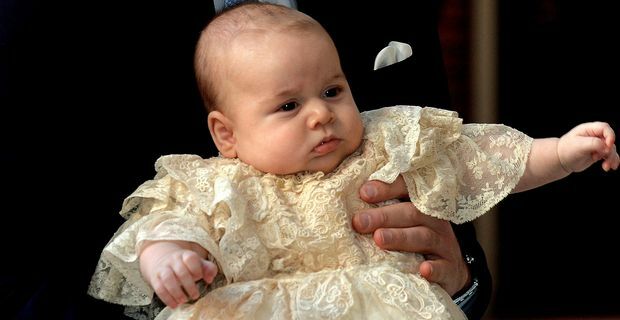 They were informed that Prince George was wearing a copy of the traditional christening gown first worn by Queen Victoria’s daughter Princess Victoria (mother of the Kaiser who gave us World War 1, but that wasn’t really her fault). The music chosen was Beyonce’s 'Baby Boy' and Rihanna’s 'Don’t Stop The Music'. No, sorry, wrong again. The ditties were 'Blessed Jesu Here We Stand' and 'The Lord Bless You And Keep You', although the order of service neglected to say which R n B artists recorded them (or why they couldn't spell Jesus). Afterwards, it was not confirmed that Prince Harry suggested everybody slope off to Boujis to wet the baby’s head (again) but it’s not impossible. The christening will be the Prince’s last royal engagement for a while. He is still some way off the throne, with his great-grandmother clinging to the crown with the tenacity of a woman smart enough to know that her immediate successor Prince Charles is so annoying he could spark a full-blooded republican movement. It should be several decades before George even has to think about being Prince of Wales. Let’s hope he can enjoy them in relative privacy.